High quality material: the natural nylon is evenly distributed, providing stable flight and resistance for badminton. High quality cork head, smooth flight, consistent elastic. Strong structure: strong glue makes the frame strong, keeps the feather and head from cracking, maintains good flight stability, and provides lasting experience. Durability: smooth nylon are more playful than duck feathers. High quality cork head light weight, high hardness, durable. Widely used: perfect choice for amateur, beginner or professional athletes in sports, training, entertainment, etc. Packing :6pcs balls are packed in strong pipes to protect the feathers from collision. 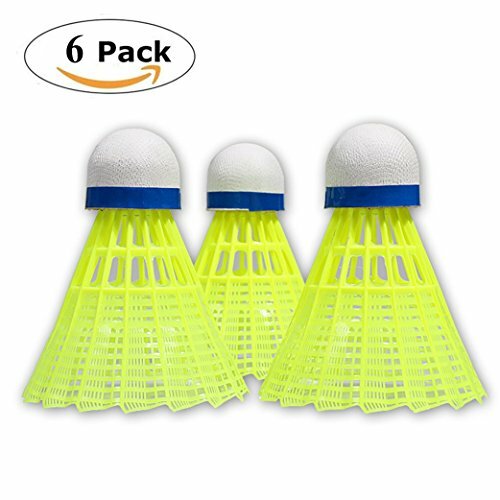 Material: high quality, good nylon strength, enhance the resistance of badminton. With special formula, smooth and soft. High performance head: these badminton heads are made of durable cork material that provides a steady rebound and steady flight path. Durability: high quality materials and strong structure provide continuous bounce, make the ball more durable, 100% test the rotation of badminton, and ensure the stability of the shuttle in flight. Application: it is suitable for all kinds of entertainment, training, competition and fitness, especially for coaches, amateurs and beginners. Packing :6pcs badminton is packed in large tubes, which has a good protective effect on badminton during transportation. If you have any questions about this product by Siomentdi, contact us by completing and submitting the form below. If you are looking for a specif part number, please include it with your message.